Okay, so this is my third tutorial about time-series in python. The first one was on univariate ARIMA models, and the second one was on univariate SARIMA models. Today is different, in that we are going to introduce another variable to the model. We’ll assume that one is completely exogenous and is not affected by the ongoings of the other. In real-life I imagine that this is kind of doesn’t exist very often, but it is worth noting that this sort of thing can happen from time to time, and the model is nonetheless useful for a short-term predictions. The common pitfalls associated with running ARIMAX models. Mechanically, ARIMAX and ARIMA do not differ. In fact in StatsModels (and other software), we don’t even make a distinction between the two models. They are so similar that making a distinction is almost petty. Yet, the distinction exists, you can go look it up. So the question is why? The answer is that by trying to combine two time-series in a regression opens you up to all kinds of new mistakes that you can make. Yeah, univariate time-series analysis has different things, like ensuring that your time-series is stationary. But multivariate time-series you start entering the weird world of causality bending. (Causality bending is my own term for what is going on here). Let’s point out the basic rules of causality. These rules of causality form the basis of why ARIMAX deserves to be designated separately from ARIMA, at least in my mind. You see, if you violate any of these rules with your ARIMAX model, it automatically invalidates that model. Let’s say that you have a variable X which causes Y with a 1 period lag. In other words, X happens, and then 1 period later Y happens because of X. For concreteness, let’s say the number of Republican Congressman elected in a year is X, and the number of tax cut bills passed by congress is Y. We’ll just assume for now that there is a pretty stable positive relationship between these variables, I don’t know if there is or not, that is for political scientists to figure out. Obviously, a Republican would need to be elected before they could influence the number of tax cuts they give out. But what if we got it wrong. What if we regressed X on the lag of Y. We literally just put the cart in front of the horse. That would imply that tax cuts cause republicans to get elected. We violated rule 4 or rule 5. That just won’t do. In general, there is no way to avoid this situation except to use your intuition. However, there does exist a test, which can help you to identify whether or not you are making this mistake. That test is a granger-causality test. I wouldn’t put too much stock into this test, mostly because it won’t identify contemporaneous causality. But hey, it would be worth a look to see if we are making an obvious flaw. So the other problem is there is no way to create a stationary time-series by adding up non-stationary time-series, sort of, there is a special case which would be fun to take a look at called cointegration. We’ll build up to that. For now, if I have a stationary time-series Y, and I regress it on a non-stationary time series, the math will let you do this, you end up with a contradiction. The math is forced to do some weird stuff to make it work out. In fact, your X variable must be cointegrated with your residuals. Uh-oh! That means that Y must be a linear combination of noise and X. Things, just got heteroscadastic, serial correlated, and biased. Biased? Really? Why? It got biased because in order for X and the residuals to be cointegrated the residuals have to be trending, which means that they can not have an expected value of zero. Therefore, the standard proofs that OLS is not biased don’t work, because they depend on the residuals having a mean of zero. So we have to make sure that our X is also stationary. Alright, you want some code! Let’s start with a dataset that you can download. Here is a dataset that you can play with: salesdata2. We don’t really care about the month variable. So let’s see what these variables look like as time series. We’ll use the following commands to visually inspect these variables. With this you can clearly tell that both time-series are trending which is a fairly clear sign that both series have unit roots. We can check whether or not they have unit roots by using the augmented Dickey Fuller (ADF) test. 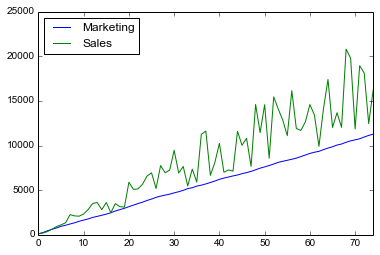 Also, notice that Sales is more volatile than Marketing. Treating this will be a subject of a future post. Clearly, we can not reject the null-hypothesis that these series have a unit root. So we should difference both series as a first step. But let’s just run a naive regression to see what happens on the undifferenced time-series, and then again on the differenced time-series, here’s the code for the first regression. And here is the code for a differenced time-series regression. Kurtosis:                       3.405   Cond. No. 808. Clearly, there is a difference between these two models. One is just plain wrong. Well, let’s think about this logically for a moment. We get a better fit with the first regression, but when we think about what is going on here, we can remember that both time series are trending. There is a third variable in the mix. Essentially, time is correlated to both my input and output. What happens is that we get a very significant, and wrong, estimate because our coefficient is the ratio of the trends, not the effect that X has on Y. That’s why we get the multicollinearity warning too. Uh-oh, that must mean that the first is wrong, and the second is right. But there isn’t anything significant in the second, we can’t say anything. Well, what if we didn’t difference marketing, but we did difference sales? Well, that leads to a consistency problem, we have a series without the unit-root regressed on a series with a unit-root, and that causes the problems with error terms that have to have a trend. Okay, so at this point, we can start looking for the correct ARIMA model using ACF and PACF plots. I’m not going to do that since I covered that at length in my first tutorial. Let’s turn our attention to something else. This issue of causality. How is it that I know that Marketing is driving sales and not vice-versa. Finally, here is the full blown code for the correct ARIMAX model. I know this is the “correct” model because I generated the data. But there is more to talk about with this dataset than meets the eye. The biggest problem comes from the fact that I am using non-normal errors, which is throwing things off a bit. So that’s it. The basic take aways are that when introducing another variable into your time-series, you need to make sure that the time-series is consistent, in that the variables are integrated to the same order, and that the causal structure of your model makes sense not just intuitively, but statistically as well. Thanks for sharing your knowledge ! I noticed an error in your code though, and I really don’t know what you wanted to do, even if the code seems pretty clear to me. This line fails for me. I guess you wanted to created a new dataset, but is there something missing ? Again thanks for pointing this out for me. One important will be how to deal with exogenous variables when you have quite a lot candidates? Secondly, how one can be sure that there is not overfitting when including more than 2/3 exogenous variables in the model. I have read about lasso regression, but not sure how to applied to an ARIMAX model. Let´s say you have around 50 observations and end up with model with 8 variables (+ dependant Y). How will you evaluate that there is not overfitting on that model. Lasso regression would work in this case, typically statsmodels does not have an implementation though. You would have to build your own maximum likelihood estimator and then tack the regularization term on the end of the likelihood function. Unfortunately, that is very much a custom build, but it can be done, which is beyond the scope of what I was trying to do in this blog post. This article saved my life. I’ve been trying to find something to explain implementation of multivariate time series regression in ARIMA. If we use the ARIMAX model with a test dataset to make out of sample predictions, does it work alright or is there anything we need to watch out for? Also, just a small correction, the grangercausality results that you show are both identical. It would be helpful to see the second result so that we can appreciate the difference. Thanks a lot. I’m so glad you found this tutorial useful! The model should work just fine with out of sample data. The trick is to make sure that your autocorrelation is accurate. I believe the predict method on your statsmodel arima class implements this correctly (it’s been been awhile since I read the documentation though). As for the granger causality test, I’m sure I just copied and pasted the wrong set. Thanks for the heads up. It’s hard for me to point you in the direction of solid resources at your level without knowing your level personally. That being said the statsmodels documentation is generally a pretty good starting point http://www.statsmodels.org/stable/index.html They have an entire section on time series models: http://www.statsmodels.org/stable/tsa.html. Also, if you want some personalized one on one training you can give me a call at (801) 815-2922 or email me at ryan@barnesanalytics.com. I’d be happy to help. Muddassir, I’m sorry that you didn’t find this post helpful. You can use this model to forecast, you just assume (with this model) that the variables are not endogenous, i.e. you have exogenous variables to regress with. I believe that the title of the post mentions that I’d be using ARIMAX, so I definitely didn’t mean to mislead you. My guess is that you are looking for a model like VAR, VECM where the variables are completely endogenous with each other, right? I’ll look into writing up a post about that, thanks for the suggestion. Thanks for quick reply…i have 4 years of data 2007,2008,2009,2010 data with 10 predictor variables and 1 target variable . Note: predictor variables are not given for 2011 data . The two Granger Causality tests are stille both identical and as such, I have no idea of what to look for — can you post the correct test results?